"Stamp It! Ink It! Scratch It!" Welcome to the Stampscapes Stampbord page. Here you will find information on this dynamic stamping surface. Click on the links in the left frame to view the different areas. Scene to left stamped on an ATC sized Stampbord. 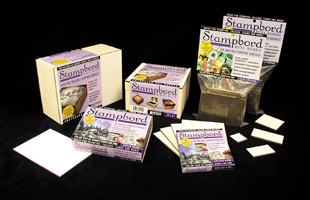 The Stampscapes website is slowly phasing Stampbord products out but you can find this wonderful surface from Ampersand Art in larger sizes under the naming convention of Claybord Smooth. In the meantime we still have a few sizes in stock. Video 96. Snowy Creek on Stampbord. Video 78. Loon on Stampbord. Video 44B. Calm Seas. Part 2 of 2. Video 44A. Calm Seas. Part 1 of 2.